Steel-frame and steel-built all-weather arenas provide a durable and long-lasting solution to all-year riding and can be designed especially for your stable, stud or as part of a local equestrian club or horse-riding school. For those who own or train horses a modern steel-framed indoor riding arena is a perfect antidote to the vagaries of the British weather which can make it difficult to ride out or to practice jumping or dressage in the winter. Steel framed arenas provide structure and space and can be finished in a variety of materials. A steel frame doesn't mean you need to have steel panels or cladding. Many steel built arenas, use wood and glass to provide light open spaces for indoor riding arenas. 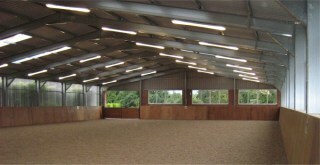 The flexibility of a steel-built design is that the riding arena can be fitted with large window spaces, skylights and often finished off with wood or wood panelling to maintain a natural aesthetic riding arenas provide a guaranteed year-round training and riding facility Steel buildings also provide an excellent option for Equestrian Building and Stabling or see our section on sports arenas for outside use of steel framed construction. Get design help and quotes for equestrian centres and arenas from established steel building constructors. Just click the Quote Me button below to get started! If you're buying a riding arena you'll know how important the horses are to you, so you'll appreciate that it's the little things that matter when your building, designing and thinking about a new riding arena.